This article is to give you a quick preview of phpFox v4.6 Material Template. We know that you are all excited about this latest version of phpFox. In this version, you'd be able to choose between the current template, the Bootstrap Template, and the new template, the Material Template, to use on your phpFox site. For now, while we are still finalizing everything, we'll give you an idea of how the Material Template would look like. Sit back and relax as we take you to the future of the social network. phpFox v4.6 Material Template Sign-Up Form Simplicity is the key. We made the sign-up form easier than it was before. People can now signup to your site in just a few seconds.Home Page Your members will absolutely stay longer and will be encouraged to do more activities on your site.Notification Say hello to the new notification looks. Your users will surely be impressed with this new look of the notification bar. User Profile Page Your users will have a great and better experience on their profile page. It is now easier to change and update cover and profile photosVideos Page Users will enjoy this new layout of the videos page.Scroll-to-Top Button One of the new features of phpFox v4.6 is this Scroll-to-Top button. Your users can just easily click this button to quickly go back to the top.Status, Comments, and Likes Your users will become more active in posting status on your site. The number of Likes and Comments are visible and easily noticeable.Shortcut Button Your users can now easily add Blog, Photo, Video, etc using this small (+) shortcut button on your site.Blog Blog readers will enjoy this new look of the blog detail page. It is now more spacious and has enough space for putting the blog banner and the content itself.We are planning to release this version by the end of December this year (2017).You can contact us in your client area account if you have any questions about this latest release. You can also send us an email at hello@phpfox.com or chat with our live chat agent on our website.Please check out this video for a quick preview of phpFox v4.6.0 Material Template. phpFox 4.6.0 Development Release The Developer Build of phpFox 4.6.0 together with the Material template is now available to 3rd party developers. 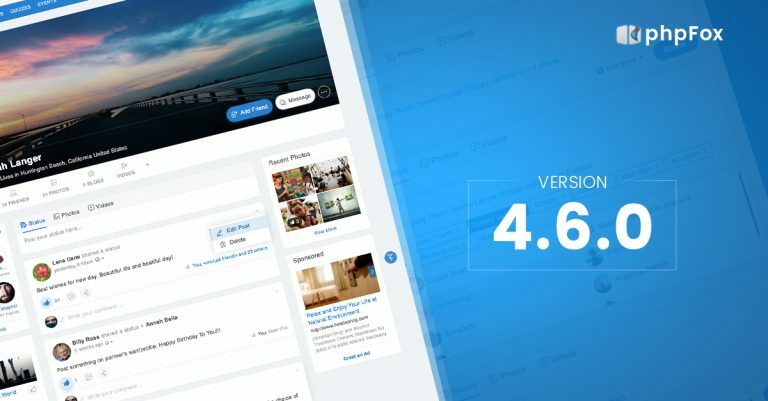 This developer version of phpFox 4.6.0 is a development release which allows all the 3rd party developers to test and tweak features in phpFox's popular Social Network platform. Compared to the latest stable version, this edition contains subtle modifications that make it interesting for phpFox's die-hard fans. 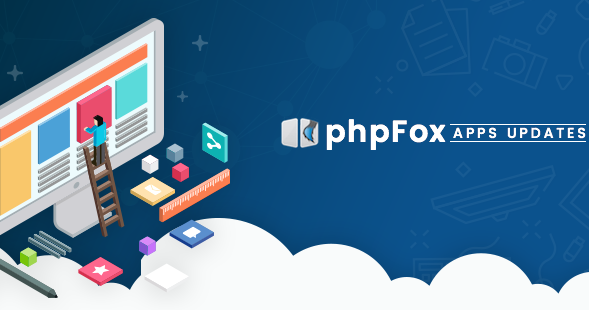 As you expected from phpFox, you will get a platform with the very latest design.Strictly for phpFox 3rd Party Developers and Testing Please note that this version of phpFox is strictly a developer release. The main purpose of this release is to check the compatibility of all the 3rd party products in phpFox 4.6.0 Beta Version Soon We are planning to release the Beta Version within the first week of December. This beta software is for all the clients who already have the phpFox license. In this version, you'd be able to access the public beta and try out the latest features. You can provide feedback directly to phpFox via your client area account. www.phpFox.com Start Your Social Network Today!